Monday November 12, 2018: In a special episode, Sonny dreams of the life he may have had if he made different choices. In Brooklyn, 1985, a young Sonny, (played by Joshua Benard), holds Vincent Marino at gunpoint and shoots him on Scully’s orders. Sonny wakes up from his dream in Margaux’s home. He thinks to the past and envisions Mike arriving before he shoots Marino and pleading with him to put the gun down and walk away, which young Sonny does. Sonny wakes up again in Margaux’s house in a different life. He notices photos on the mantel, including ones of him as a police officer, of Dante, and of Olivia and two daughters. Olivia enters and hopes Sonny isn’t thinking of backing out of their trip to Port Charles. She wants him to make an effort with their son and doesn’t want to hear him lecture about right and wrong today. Sonny and Olivia arrive at Pozzulo’s and surprise Dante, who is married to Sam. 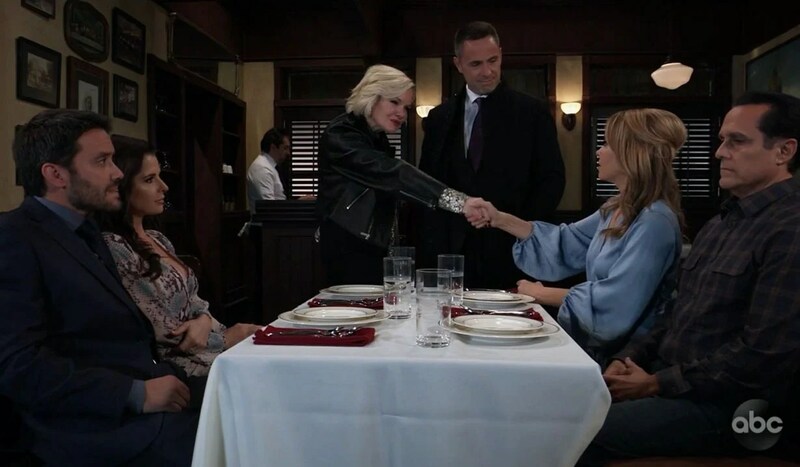 They grab a table when Julian and Ava enter and meet Sonny and Olivia, though Sonny rebuffs his handshake. They gush about Dante, who is a priceless VP in their outfit. Julian and Ava head to the back office and Dante is furious with his father for disrespecting Julian. Sonny says everything he touches is rotten. They argue for a bit before Dante goes to the backroom to apologize to the Jeromes for his father. Jason enters, having come from supervising the latest shipment which just arrived. Sonny stops by the PCPD. He speaks with Anna, who is the commissioner, about putting the Jeromes away because they are responsible for half the drugs that make their way to his precinct in Manhattan where he’s a sergeant. She is unconcerned because if she takes the Jeromes down someone else will just rise in their place. 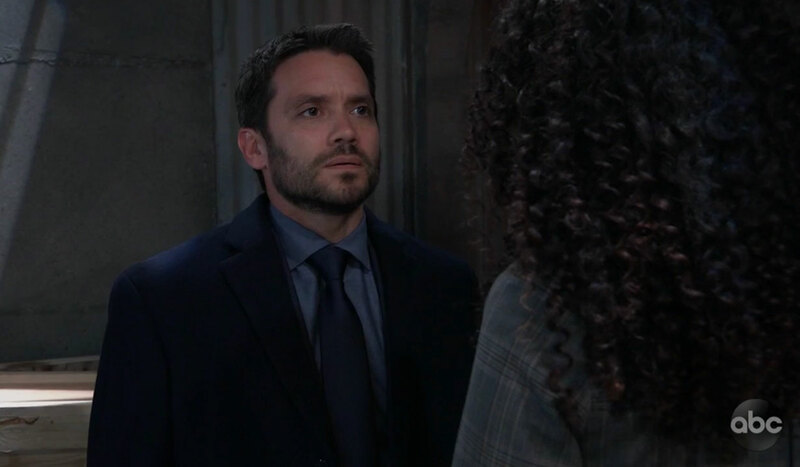 Sonny speaks with Alexis, who is the DA, about Anna’s attitude. Alexis explains Anna hasn’t been the same since the nineties when her only daughter Robin contracted HIV and died of AIDS. Sonny returns to the restaurant and has words in private with Julian, Ava and Jason. He wants them to cut Dante loose. Suddenly Carly storms in screaming she will make Ava and Julian pay for driving Michael out of town. He had to take a job in the ELQ office in Singapore because of them and she vows to make them pay. Sonny stops her from striking Julian and walks her out. Dante meets with Jordan on the docks to turn evidence against the Jeromes, though he wants it kept secret. Sonny takes Carly to Charlie’s for coffee to sober up. She introduces herself as AJ’s wife and explains Ava and Julian have her husband AJ, the CEO of ELQ, on their payroll. Michael was chased out, and before he left she and her son fought. Sonny returns to the PCPD to apologize to Anna. Suddenly DEA agent Jordan arrives with Julian and Ava in cuffs. They vow the feds won’t hold them for long. Later in the interrogation room, Julian orders Jason to eliminate whoever turned against him. Sonny returns to the restaurant to talk to Dante, who he knows is planning to take over with the Jeromes out of the picture. Dante admits he is and won’t be talked out of it. Sonny overhears Dante make a call to someone to meet at Pier 55. Sonny discovers Carly enjoying a beer at Charlie’s. They discuss their sons. He suggests she join hers in Singapore, and she advises he go knock some sense into his. Later, Olivia arrives and overhears Carly on the phone with Michael. Olivia interrupts because she heard Carly mention her son Dante’s name. Carly says her husband saved her from the Jeromes, and he just left to meet their son. At Pozzulo’s, Dante tells Sam that this is their chance to take over the city, but Sam would rather they leave and not be a part of this. Dante lets her know if she doesn’t like the life he’s given her then she can leave and he’ll find someone to take her place. He walks out, and she leaves her wedding ring on the counter. Jason walks in and asks if she’s okay. She cries her marriage is over, and she plans to leave town for Wyoming or Montana, somewhere she will feel free. She suggests he do something for himself for once like get a motorcycle and ride away because he deserves better than this life. Jason gets a message to meet at Pier 55 and tells Sam that he has to go to work. Sonny finds himself back in the past looking at his younger self holding Marino at gunpoint. He prevents Mike from arriving to stop his younger self, indicating it’s not Mike’s place to make this choice, it’s Sonny’s. Younger Sonny says, “I know,” and pulls the trigger. Sonny wakes up at Margaux’s place back in his own life. Joss tells Cam she’s had a good time with him. Monica is stunned to overhear Drew and Kim discussing Oscar’s plans. Alexis asks Oscar if he’s sure he’s ready to handle this. Curtis asks Jordan if she’s still looking at Carly for the murder. Carly admits to Jason that she’s worried. Margaux wonders why Sonny stayed at her place last night.